​So this podcast is kind of a big deal for me and negotiations.ninja. It’s a milestone podcast! Podcast number 10! And I couldn’t think of anyone better to celebrate it with than Anthony Iannarino! Anthony is a speaker, a best-selling author of two books – both are fantastic – and a sales leader. He has worked for and spoken to global giants like Accenture, Abbott Labs, NetJets and Wells Fargo, and is one of the 50 Most Influential People In Sales. In this podcast (an extension of our first conversation) we dive deep into how procurement and sales overlap and how we can collaboratively drive more value for the business when it comes to negotiation. ​Stan Garber, Alex Yakubovich and Greg Tennyson can see the future. 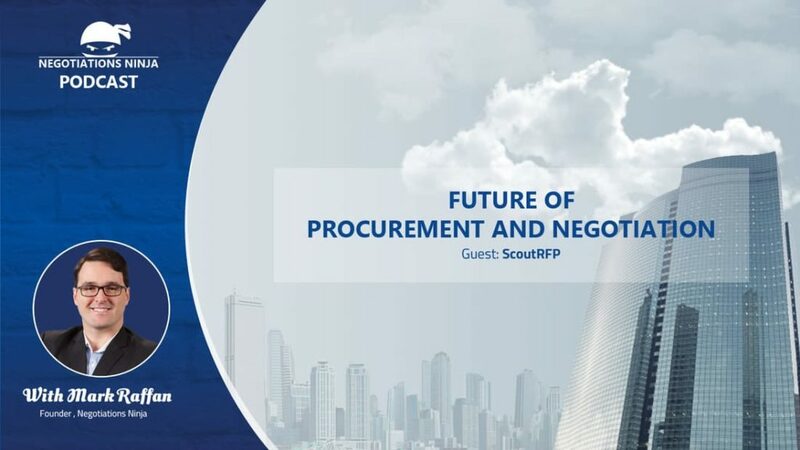 In this episode we discuss technology’s role in procurement and negotiations, where we are, where we’re going, how do we get there. Stan and Alex started Scout, which is an intuitive Cloud based platform which encompasses everything from project intake through sourcing pipeline to contract and supplier management, RFX, and reverse auction tools. This conversation blew my mind. ​The “Sales Hunter” himself, Mr. Mark Hunter, joins us today. Mark is one of the Top 50 Most Influential Sales and Marketing Leaders in the World and as the author of two best-selling books. In this interview we talk about how to negotiate better in a sales context, asking the right questions and we also talk about some of Mark’s failures around negotiation. Mark has conducted thousands of events on sales has spoken in more than 25 countries.